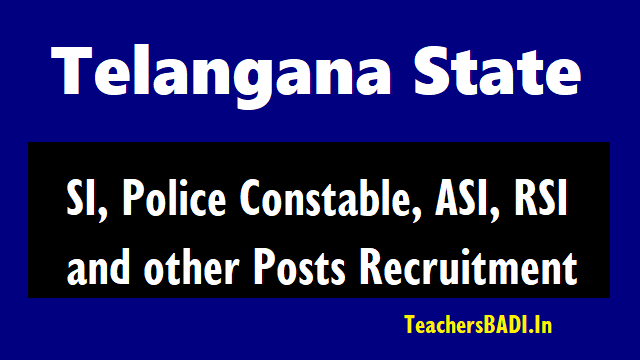 Telangna State Police Recruitment 2018 Notification, TS SI, Police Constable Posts 2018,Online Application, Post Detals, Eligibility Criteria, How to Apply: Effecting major reforms in the police sector, TS Govt nod for recruitment of 18,428 police personnel in different categories. To encourage more women to take up police jobs, Govt decided to implement 33.3 percent reservation in civil category and another 10 percent in Armed Police category. In a significant move, he also took a decision to relax physical fitness tests for both female and male aspirants.The mandatory 5 km run for men and 2 km run for women are a thing of the past now with KCR directing officials not to conduct anymore hereafter. READ : TS SI, ASI, RSI, Police Constable Posts Recruitment 2018, How to Apply? For Police Constables: Candidates should have Intermediate(12th Class) Qualification. 1. For SI: Candidates should have age limit between 18 to 28 years as on 01-07 -2015(General). For SC, ST Candidates 5 years age relaxation and for BC Candidates 3 years age relaxation(33 years age candidates can apply for this). 2. For Police Constable: Candidates should have age limit between 18 to 25 years as on 01-07 -2015. For SC, ST Candidates 5 years age relaxation and for BC Candidates 3 years age relaxation(30 years age candidates can apply for this). Earlier, men contestants were tested in shotput, high jump, long jump, 100 metre run and 800 metre run. However, they will be having the choice of undertaking 800 metre run (mandatory) and any two from the aforesaid tests. Likewise, for women contestants, the physical fitness tests involves 100 metre run (mandatory) and another test (either shot put or long jump). Like other recruitment tests that are being conducted in the new state, emphasis will also be laid on Telangana history in police recruitment jobs. Aspirants aiming to crack police jobs need to have a thorough knowledge about history and culture of Telangana since they would be posed related questions in the written test. 1. 5 km run for men and 2 km run for women not to conduct in this recruitment. 2. Only written exam will be conducted. 3. Medical examination left eye 0.75 right eye 0.5 Sight. Candidates should submit the Online Applications through Telangana State Police Web Portal www.tslprb.in. Once the candidate submits the application, no corrections can be made. Hence candidates are requested to carefully verify the details before submission. 4. Download TS Police constable hall ticket:..